This is a technique I'm still experimenting with, though I've already pieced together one entire sweater this way. I tried this when my serger was still very new to me, and I now believe that further attention to tension and differential feed settings could have produced even better results. 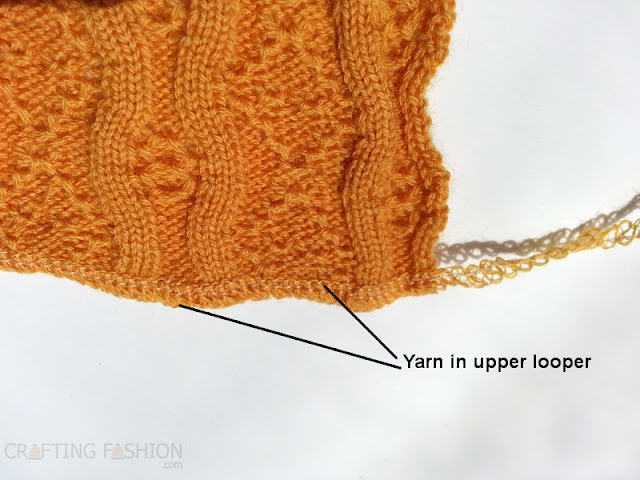 I'm talking about using yarn in the loopers of the serger, in place of regular serger thread or Wooly Nylon Thread . 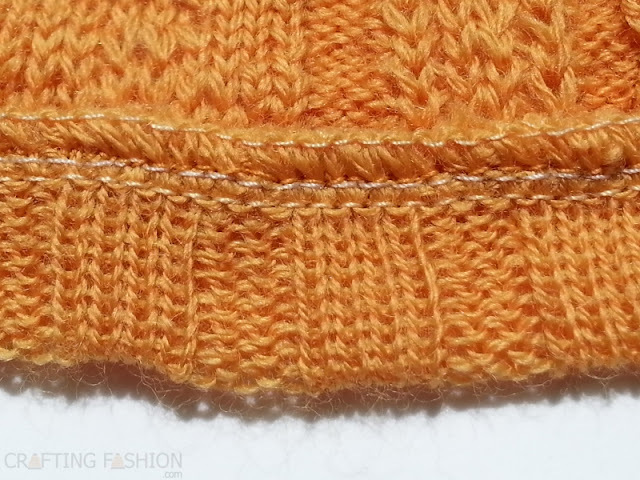 Yes, this is a technique you can use only if you have a serger and you have access to matching yarn for your sweater knit fabric. Since many readers of this blog either produce their own fabrics (and therefore have the appropriate yarn), or purchase artisan fabrics (Your artisan/supplier probably has extra cones for purchase. ), I thought I'd go into this topic briefly. Don't get me wrong: I'm still happy with the results from high quality serger thread. I'd categorize this "Yarn in the Loopers" technique as experimental. Even with the enlarged photo, you can barely see the yarn in this 4-"thread" balanced stitch on my Providence fabric. But that's the point! 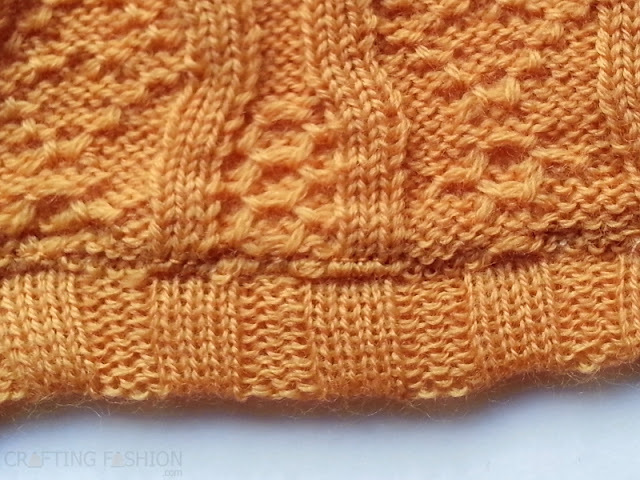 I first heard of this technique in Pam Turbett's Revised Knit, Cut and Sew: Book 1. Turbett briefly discusses Sue Le Neve "who [uses] quite substantial wool yarn through the loopers to overlock the edges...." Though Le Neve's method involves bypassing the tension discs as well as several thread guides (I think she uses a heavier yarn. ), I run my 2/20 yarn through all yarn guides and tension discs. The cone of yarn is placed on the table behind the serger. My upper looper tension for the yarn is slightly tighter (!) for my very soft, springy wool yarn than for regular serger thread. If you try this at home, be sure to spend time adjusting all the tensions. I don't plan on trying this with cotton yarn, because I don't think the cotton would be springy enough. The yarn loops really blend in with the rest of the fabric, making the inside of the garment just a little nicer. I have the feeling that this blend-ability is what people like about Wooly Nylon in the loopers, when they can get a matching color. I've never used Wooly Nylon, but I do plan give it a try sometime. That's right! From the public side it makes no difference whatsoever! Do you have any unconventional ways of serging? I'd love to hear them. Next, I'm going to try yarn in both loopers.